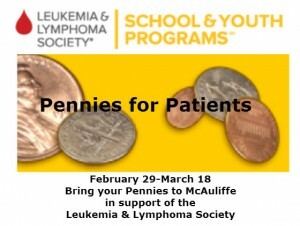 McAuliffe is participating in the Pennies for Patients Campaign benefiting the Leukemia and Lymphoma Society. We will be collecting pennies, nickels, dimes, and quarters during this campaign. Scholars will be given a box to bring home to collect coins along with a letter to inform families/friends about the Leukemia and Lymphoma Society. Our goal is to raise $650 and the sister crews who raise the most money will be awarded with an Olive Garden lunch. The Drive will start February 29 and go through Friday March 18th. The Leukemia and Lymphoma Society is the world’s largest voluntary health organization dedicated to funding blood cancer research and providing education and patient services. They exist to find cures and ensure access to treatments for blood cancer patients.